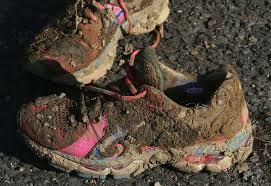 One day at school, my teacher told us repeatedly to stay away from a certain muddy area on the playground. The rain had poured for several days, trapping us inside, and we were restless and filled with energy. Just before going out to PE, my teacher, a firm, no-nonsense leader, reminded us once again to stay off the top of the hill. Where are you going to avoid? she asked. The top of the hill, we chorused obediently. Now, my second grade feet were very eager for a good run outside, which is saying a lot. My feet usually weren’t eager to run anywhere, unless it was to a new book. I guess the days of rain had gotten to me like they had the rest of my friends. I was ready to run. I even had those shoes that made me “run fast”. Guess where I went first? The top of the hill. And it wasn’t even to be purposefully disobedient. I wasn’t a disobedient child. I think I just got so caught up in my excitement, in the adrenaline, that I didn’t even realize that I was running straight into disaster. I quickly realized my mistake, though, as my feet slid out from under me and I landed splat in the middle of a muddy pool. Oh, wow. I was led back to my room wearing the evidence of my wrongdoing. My throat was tight, my lips were trembling, and my eyes were quickly filling up with tears. I was truly sorry. When the teacher had repeatedly told us not to run on top of the hill, there hadn’t been a doubt in my mind that I’d obey. And then, somehow when I went outside, I was in the mud before I knew it. The door opened, and she had her back to me. She was writing on the board. When I think back now, it’s like the teachers you see in movies. She had her hair in a bun, glasses on her nose, the whole nine yards. I was prepared for the worst. When she turned around, her eyes widened at the sight of the muddy disaster in her doorway. And then, just as I was flinching for a rebuke, her head tilted and her eyes literally softened. They visibly softened. I will not forget that moment as long as I live. Just reliving it right now in my mind makes my eyes fill up with tears. I didn’t deserve the grace that she showed me that day. She had told me over and over not to do something and I turned around and did it anyway. I deserved a punishment. Instead I received grace (and a clean pair of clothes…right down to the underwear. That mud was serious stuff!). 56 Then a servant girl, seeing him as he sat in the light and looking closely at him, said, “This man also was with [Jesus].” 57 But he denied it, saying, “Woman, I do not know him.” 58 And a little later someone else saw him and said, “You also are one of them.” But Peter said, “Man, I am not.” 59 And after an interval of about an hour still another insisted, saying, “Certainly this man also was with him, for he too is a Galilean.” 60 But Peter said, “Man, I do not know what you are talking about.” And immediately, while he was still speaking, the rooster crowed. 61 And the Lord turned and looked at Peter. Oh, how human Peter was. Jesus told him what was going to happen. He warned him, so to speak. Peter was adamant that he would never deny Jesus, that he’d even follow Him to the death. And then he was overcome with the situation, with his adrenaline, with his uncertainty. And before he even knew it, he did exactly what he knew was wrong. He did something disastrous to his own heart. He denied the Lord. Not once, but three times. And after the third time, the Lord looked at him. Peter deserved a punishment. He was guilty of denying Jesus. The evidence was all over his face, and his words were still hanging in the air around him. He was wearing his sin. I wonder what was in the Lord’s eyes as He looked at Peter. Was it sadness, or disappointment? Was it a knowing look? Or did He tilt His head? Did His eyes visibly soften as they met the guilty, anguished eyes of the one who had denied Him and was so sorry? Jesus was Grace in human form, walking and touching those on this earth. His grace is still alive and freely given today. It’s a gift that we don’t deserve. The evidence of our sin is undeniable. Like my muddy clothes, we are covered in the darkness of our sin. We deserve the worst. But just like my second-grade teacher, who gave me a new set of clean clothes to wear when I didn’t deserve them, Jesus is waiting to give us a new set of clothes to replace our sin-stained ones. What is it that you have done? Have you denied Him? Have you replaced Him? Have you rejected Him? Have you gone to the place that He told you not to go? Is the proof of your sin all over you, like a layer of muddy garments? Turn to Him. Look at Him. Look in His eyes. See the understanding and mercy there. Watch Him tilt His head and reach out His hands, the ones scarred with your name, towards you. Take His hands and take the grace that He is waiting to give you. Put on your new clothes of grace. And then…stay away from the mud! This entry was posted in Devotionals and tagged Christianity, forgiveness, grace, Jesus, mercy, Peter denied Jesus, sin. Bookmark the permalink. Thank you for this beautiful analogy Paige. When the Light shines on the mud (darkness) oh! how He cleanses and heals us and makes us whole. Thank you for reading and sharing your beautiful comment! Thank you! So many times we fail and we look down just to think how did we get here but His grace and mercy always saves us. You are so right Cherie! I appreciate your visiting and commenting!!! Such grace…I love this. Thanks for sharing.